If you’re the kind of person who obsessively follows news about your favourite bands or gets excited by a new photo of Britney Spears stumbling out of a nightclub at 3am, Fanity could be for you. Essentially, this new site – launched by a Dutch team – is an alternative take on the RSS reader that allows you to follow music acts rather then news sources. So, If you’re interested in Kanye West, Jay-Z and Eminem (for example) you can mark yourself as a “fan” and then news, multimedia content and social media activity about your chosen celebrities is pushed into your Fanity stream. The feed can be filtered to just include official postings by your chosen artists and by media types, such as blog, photos and videos. There’s also a “Celebrity dialogs”filter, letting you know what the famous people you’re interested in are saying about each other on Twitter. The media filters aren’t yet 100% accurate either. Sometimes, say, a post in the photos stream won’t actually contain any images. An easy way to jump into the dedicated feed for each celebrity from the filter controls would be good as well. At present it’s possible – just not easy. Publishers may take issue with the service displaying full articles in the feed. Although these are pulled in from news sources’ RSS feeds and include a link back in each post, we could see this being a potential problem if Fanity becomes a commercial success. In the future, founders Yvo Schaap and Raoul Kiksen plan to add social features to let fans interact with each other on the site and do deals with celebrities to provide unique content for the service. They tell me that the reaction from music industry figures was positive when the service was demoed last week. 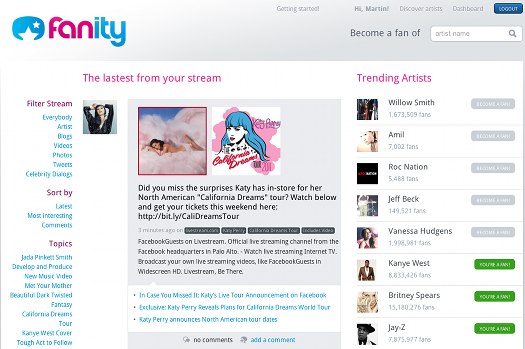 You can sign up to Fanity here.